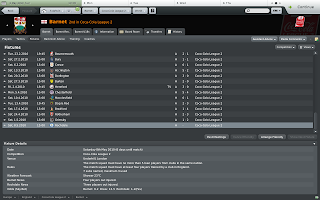 This is the third part of a series of posts dedicated to my game as Barnet in Football Manager 2010. 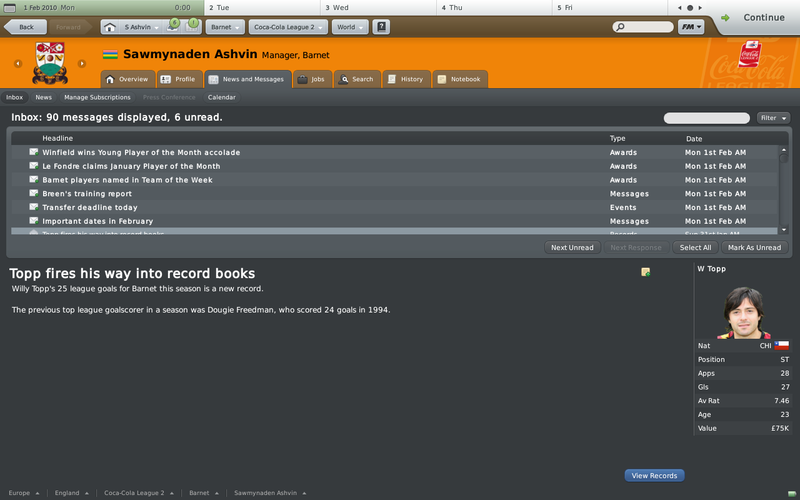 The previous part is Football Manager 2010: The Barnet overload. 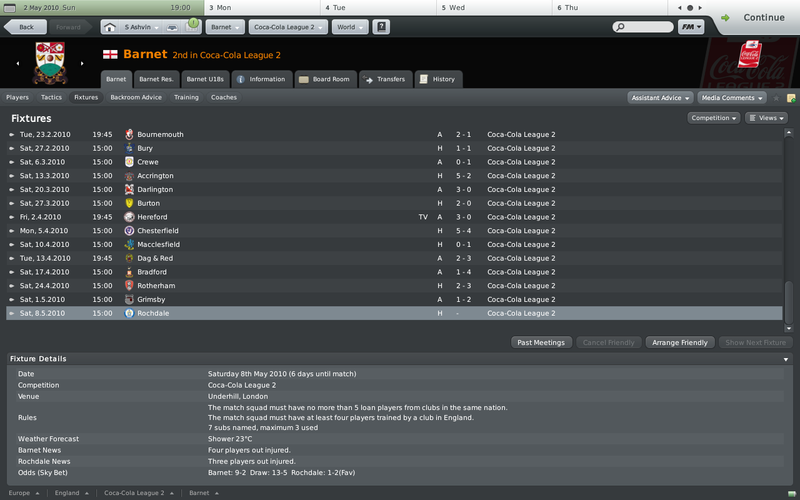 I have finally completed the first season, and managed to be runner-up in the league just behind Rothertham. 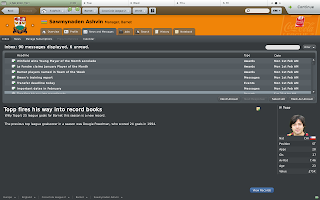 Considering I only expected to qualify for the play-offs in this Football Manager 2010 save, this is well beyond my personal objectives and much better than my in-game objective of consolidating the club. There is no need to say that both the Barnet board and my fans are extremely pleased at gaining promotion to the Coca-Cola League 2, which seemed an impossible dream at the start of the game. 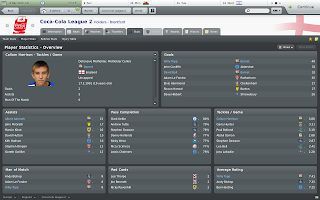 As you can see in the final league table, my strikeforce was without doubt my main asset with Willy Topp, a free signing, being the league highest goalscorer with an amazing 40 goals and David Ball, whom I loaned from Manchester City, scored 32 goals in the league. Will Topp turned out to be my best signing and has generally been setting the league on fire scoring hat tricks for fun although he did go through some phases where he would play like crap and look complacent throughout the matches (generally dealt with by first telling him that I was disappointed by his performance and then telling him that I had faith in his ability). 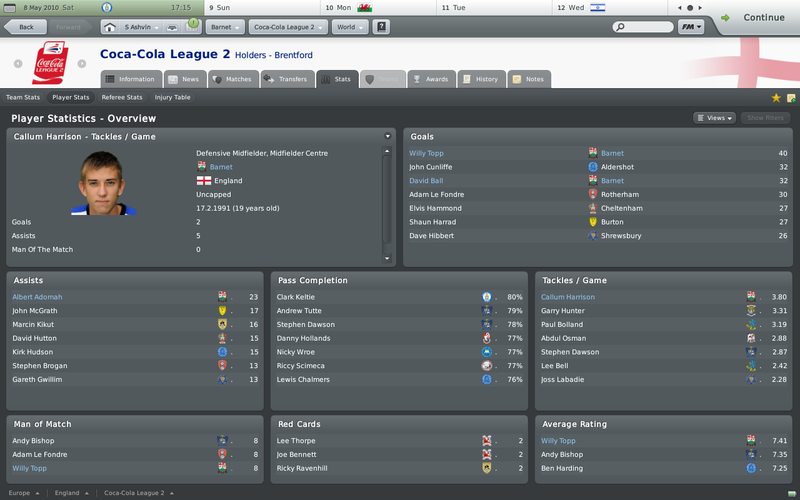 Callum Harrison was also an excellent loanee, and started most of my matches as my defensive midfielder. By the end of the season, I was using him in rotation with Ibrahim Sissoko who also turned out to be a great signing and extremely popular with the fans due to his hard working game. The good thing about Sissoko is that he doesn't just run around like a headless chicken like some players but also contributes to the game by scoring goals (usually 25 yard strikes) and netting assists. Although my team performed extremely well generally in the league, I did have a hard run of games by the end of the season, which is basically FM2010's way of trying to screw me over for having good tactics. 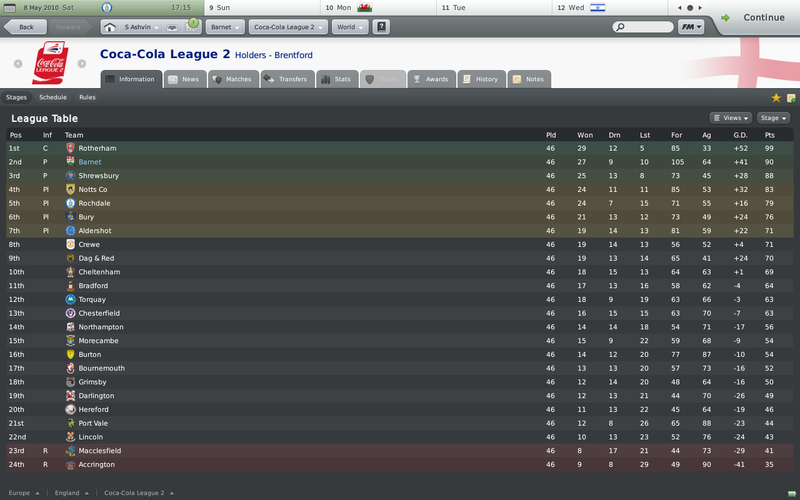 I lost 5 consecutive matches and also had my biggest loss of the season; a 4-1 defeat against Bradford away. 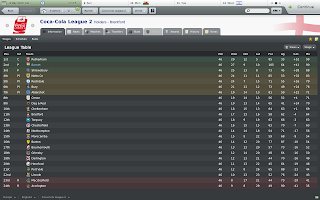 Thankfully, I did manage to win my last match against Rochdale to secure my second place in the league. I will blog about my first matches in the Coca-Cola League 1 once I've played several matches. Obviously, my first priority when the new season starts will be to strengthen my squad since I don't think my current Barnet players have what it takes to consolidate the club's position in the league. My priority will be to loan some players from the Premier League, especially a striker, a left winger, and an advanced playmaker.